In 2015-16, CARE reached more than 80 million people through our development and humanitarian projects and initiatives. Find out more on our interactive world map showing our reach and impact. The figures below are for the number of direct participants that CARE reached through our projects last year (2015-16). These are people who are directly affected by the problem(s) that a CARE project seeks to address, and who are directly involved and actively engaged in project activities or are receiving services/goods/resources from CARE or through a CARE partner organisation. 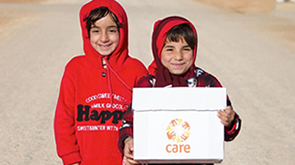 In 2015-16, CARE implemented 371 humanitarian aid projects and initiatives, which reached over 11 million people directly. Figures are rounded to the nearest 0.1 million or to the nearest 1,000. In responding to a humanitarian crisis, CARE may provide more than one type of assistance to an individual person affected by the crisis. For example, we might provide food assistance and water assistance to the same individual. The figures for each sector or thematic area show the number of people we directly assisted in that sector or thematic area, but adding the sector figures together would involve some double counting, and therefore gives a bigger figure than the actual number of individual people reached by our work. In 2015-16, CARE implemented 764 long-term development projects and initiatives, which reached over 69 million people directly. CARE promotes sustainable development by tackling the range of inequalities, injustices and lack of opportunity that keeps people locked in poverty. This means that we can sometimes work with the same individual in more than one sector or thematic area – for example, participants in health projects might also receive water, sanitation and hygiene services or assistance. The figures for each sector or thematic area show the number of participants in that sector or thematic area, but adding the sector figures together would involve some double counting, and therefore gives a bigger figure than the actual number of individual people reached by our work. How are we doing on our 2015-2020 Programme Strategy outcome areas? In 2015-16, 18% of our projects and initiatives were gender transformative – meaning 13.1 million people were reached by gender-transformative projects and initiatives. 9% were gender responsive and a further 45% were marked as gender sensitive, meaning they responded to the different needs of people based on their gender, but did not tackle the root causes of gender inequality. This is an area where CARE acknowledges that we need to improve, to ensure that more of our projects and initiatives are gender transformative. Only 8% of our projects and initiatives were transformative for inclusive governance and a further 5% were responsive. 62% were accommodating of inclusive governance, meaning they acknowledged and worked with institutions and power relations without significantly changing existing power relations. Again, this is an area where improvement is needed, in order to have a greater impact in reducing inequality and injustice. Two-thirds (65%) of our projects and initiatives included actions to increase resilience. Over a quarter (26%) of our projects and initiatives included, and measured the results of, innovative approaches. Nearly two-thirds (63%) carried out advocacy for pro-poor policy change. More than half (57%) of our projects and initiatives worked with strategic alliances and partners to scale up their impact. Over two-thirds (69%) of projects and initiatives included tools and resources to carry out monitoring and evaluation studies to assess their impact.